Want To Buy The Best Shampoo For Dog With Itchy Skin? Here it is! Does your dog have itchy skin? This condition is not only frustrating to the dog but also you as its owner. You have to deal with seeing the poor dog rub against everything close by, and sometimes, this ends up in loss of hair, bleeding and other problems. I went through this too with my dog, and I remember asking everyone I knew how to relieve my dog’s itchy skin at the time. Luckily, I was able to get lots of answers in the process, and my dog is now comfortable. If you are dealing with this problem, read on to find out the reasons behind the itching as well as what shampoo you can use to ease the irritation. What shampoo is best for a dog with itchy skin? As a caring dog owner, you know that it is critical to invest in a good shampoo that strips off the dirt on your dog’s coat while protecting it from dryness. It is for this reason that you should avoid using human shampoo on dogs as this can be harmful. The pH of dogs differs significantly from ours, and many vets state that human shampoo can be toxic for dogs. Your focus needs to be on dog shampoos, and you’re in luck as there are many options available. By factoring your dog’s type of skin and fur, you should be able to narrow down to a few choices. Add the fact that your dog has dry skin and you should be down to tens of dog shampoos that are suitable for this role. However, there is much more to the selection process than this. Having tried out various products on my dog during its itchy skin phase, I have come to see that the following five products work wonders. Before heading to the store for a bottle of shampoo, it is essential to ascertain that your dog indeed suffers dry skin. The thing with dogs is that they tend to scratch themselves a lot and it can be quite hard to tell if there is a problem. However, some things should be easy to notice. One would be an increase in the frequency of scratching as well as apparent discomfort when doing so. Another sign would be a dull and flaky coat. Sometimes, the skin wrinkles as a result of all the dryness. If you notice that your dog tends to scratch itself more during the night than in the day, the chances are high that there is a dry skin issue. But with pets, you have to be careful, and for this reason, I advise that you visit your vet first before changing the shampoo in case of any doubt. One of the most interesting causes of dry skin in dogs is excessive grooming. If you wash your dog too often, you are likely to strip off the essential oils and leave the skin bare and exposed. Alternating a standard wash with some dry shampoo helps in avoiding such issues. It could also be that you use the wrong shampoo on your dog. People who use human shampoos on their pets are likely to encounter this problem at some point so be sure to quit while you are ahead. What does your dog eat? Studies show that there is a direct link between what pets eat and the state of their skin. For this reason, you could be doing everything right, but the body is communicating an imbalance to you. Sometimes, it has nothing to do with what’s on the outside, and it is vital to have professional help in place when you notice that something is amiss. Does your dog have parasites or suffer allergies? These two are also leading causes of dry skin, alongside neutering and spraying. A good dog shampoo works to soothe the dry skin and make life more comfortable for the dog as you work on eliminating the cause. In the end, your dog’s coat should be more immune to the causative factors. What Are the Signs of Dry Skin? Most of the signs are visible. They include itching, flaking, and the producing of dandruff, scaling, scabs, fur loss and pimples. Some symptoms are not that obvious. If your dog smells bad, it’s probably a sign that all is not well in its skin and you need to seek a remedy for the same. It could be that your dog exhibits one, two or more of these symptoms. In such a case, the chances are high that your dog suffers from itchy skin. However, where your dog only has one sign, this could be indicative of another problem that has nothing to do with a skin condition. For this reason, be sure to get tests done on your dog before moving forward with any remedies. If your dog is the kind that is immune to dry skin, you are in luck as you will not face itching, flaking and other issues. If your dog is prone to dry skin, then you need to implement some measures to prevent any drying. For this reason, it is essential to know the breed of your dog as well as any conditions which they are likely to suffer. The good thing is that itchy skin is not a permanent condition and with the right procedures in place, your dog should lead a happy and comfortable life. One of these processes is the use of a dog shampoo that is gentle on your dog’s skin. You should also work to supplement your dog’s diet with healthy foods and anything that the vet recommends. When it comes to what to give dogs for dry, itchy skin, your vet will know best. This measure will enable your dog’s coat to be immune to dryness. With both inner and outer prevention, you are sure to steer clear of any itchy issues. Another thing that you should consider is the presence of parasites as they have drying effects on skin. If there are any present, consult with a vet as to how you should treat the situation and start working on it immediately. For baths, you should take caution so that you do not end up harming your dog in the process. You will require a dog shampoo that is best for itchy skin. You should bathe your dog often but not too much as this will get rid of the essential oils. When grooming, only a small percentage of fur should get lost. Otherwise, it classifies as over-grooming. And it is essential to consult with your vet often. Most dry skin issues can get detected and treated at an early stage as long as you keep up with the consultations. There is not much to washing a dog but overdoing it could make the problem worse. Ideally, you should scrub your dog once in a month, while keeping up with hygiene using dry shampoos in-between. However, if your vet recommends otherwise, proceed as per their advice. If you have a dog that gets dirty often, you can increase the cleaning frequency as a buildup of dirt and oils can cause a myriad of problems. In this case, go for a shampoo designed to meet the needs of dogs with itchy skin. It is important to note that dogs with sensitive skin need less frequent bathing and considering a dry dog shampoo could help you considerably. Dogs’ skins are way more sensitive than ours, and they thus require more care. Start by brushing your dog to remove any dirt on the surface before using some warm water on them as you apply the shampoo. Rub the shampoo on the skin before rinsing it out and letting your dog air dry. Most dogs fear bath times and having a treat at the end of the process helps them calm their reservations. If you can get an organic product, then all the better as it will be gentle and effective. However, be sure to check if there are any artificial and harmful ingredients in the products before using them. Also, go for something that is hypoallergenic as you ensure that you avoid anything that has alcohol in it. If you can get something that can help you fight parasites, you will prevent the occurrence of itching in future. I find that using something that deals with the rashes helps significantly in dealing with the issue for good. Be sure to consult with a vet throughout the selection process, once you are sure that your dog suffers from dry skin. What shampoo is good for dogs? This Earthbath dog shampoo does not have any fragrances or artificial colours, components which have been known to irritate dog skins. 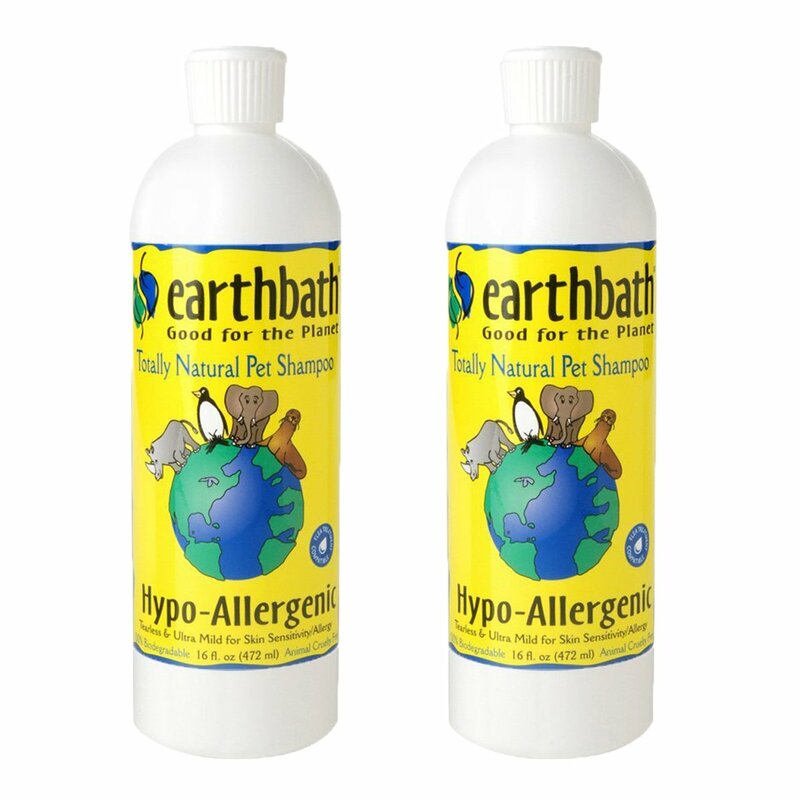 Additionally, it is hypoallergenic and comprises 100% natural ingredients, making it safe for your dog. It works to clean the coat without being harsh, thus preventing any irritation. Q: What is the scent of this shampoo? A: It smells like a combination of natural products, and it is delightful. Q: Can you classify this shampoo as tear-free? A: It is tear-free and entirely comprises natural components. Have fun cleaning your dog with this gentle shampoo that will ease the itching as it gets rid of the dirt. 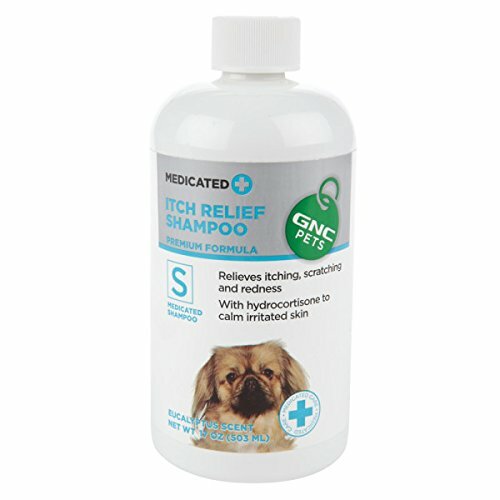 The exciting thing about this Anti itch dog shampoo is that it works on all pets. You can use it on your cats and horses too. It is gentle on the skin and has a ton of antimicrobial properties that will come in handy where there are any infections. Q: I am worried about discolouration on my rugs. Will this shampoo do that? A: No, it is not harsh enough to do that. Q: Is this shampoo anti-fungal? A: Yes, if your dog is struggling with fungal infections, this is the way to go. Put an end to the itching with this antimicrobial shampoo. This natural dog shampoo works to relieve scratching, itching and redness in dogs. One of its unique components is hydrocortisone which soothes the skin during washes. Your dog should feel much better after a bath, and you will notice a reduction in scratching. It has a lovely eucalyptus scent that is not overpowering. Q: Can I use it on my cat? A: No, this shampoo is specifically for dogs. Q: My dog has sensitive skin. Can I use this? A: Yes, it is very gentle, and your dog’s skin will not react. Eliminate redness fast with this mild shampoo. 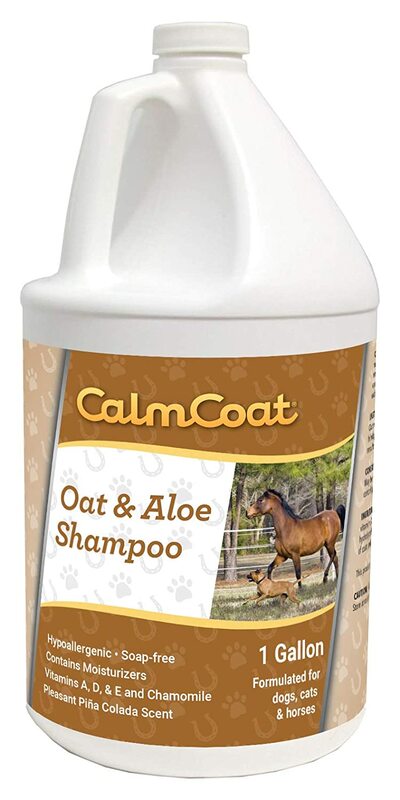 This fresh and clean dog shampoo also works on horses and cats. 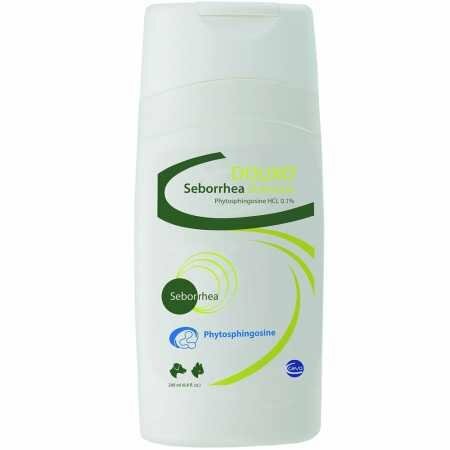 It comprises a hypoallergenic formula that deals with calming itchy and sensitive skin. Its scent is that of pina colada, and it is thus quite attractive. Additionally, this shampoo works to hydrate your dog’s skin while infusing its coat with vitamins. If you have been dealing with pests, you can use this shampoo alongside topical flea control products. Q: My dog is allergic to flea bites. Can I use this shampoo? A: Wash your dog with the shampoo and apply topical treatments and you should be good to go. Q: What does this shampoo do for fur? A: It hydrates the hair, leaving it soft and shiny. Managing the fur should be easy. If you have a dog with severe allergies, this shampoo will help you deal with the scratching and itchiness that ensues upon contact with allergens. This dog shampoo for dry, itchy skin contains a hypoallergenic base that gently cleans the skin and fur without triggering a reaction. While doing so, it gets rid of any residue and excess oils on the surface. Interestingly, it also works on cats. Q: Will this work on my dog? He has dandruff. A: Yes, this shampoo soothes, cleans and hydrates skin, leaving it clean and fresh. Q: Is there oatmeal in the components? A: No, but the ingredients in place are sufficient. Dealing with inflammation can be quite hard as most products tend to aggravate the situation. With this shampoo, this will not be the case. Remember to conduct adequate research and consult with your vet before making any purchases. In this way, you will end up with what’s best for your dog. Good luck!